Another rainy day…and a Monday no less! Today’s outfit started with these cap-toed cork flats, which I scored at TJ Maxx last week (Kenneth Cole Reaction). 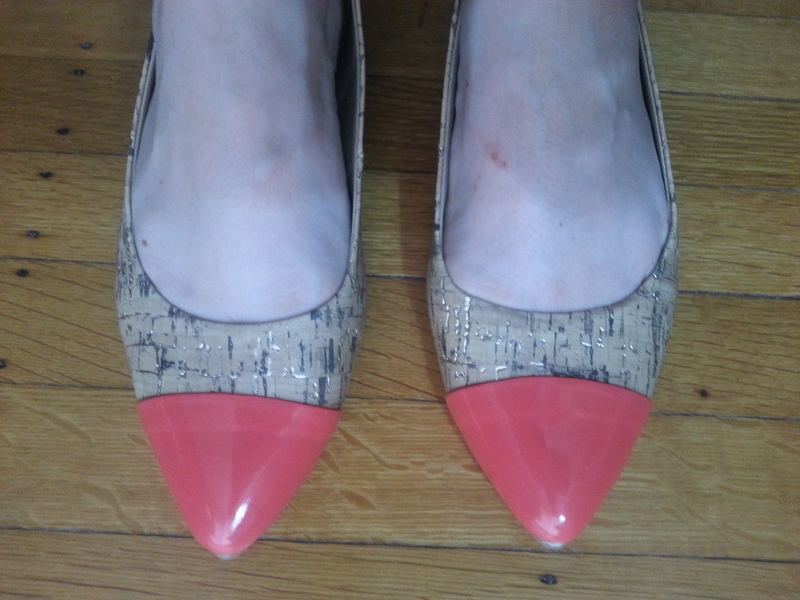 I can take or leave the cork trend this season but I knew these shoes would go with several things in my closet. 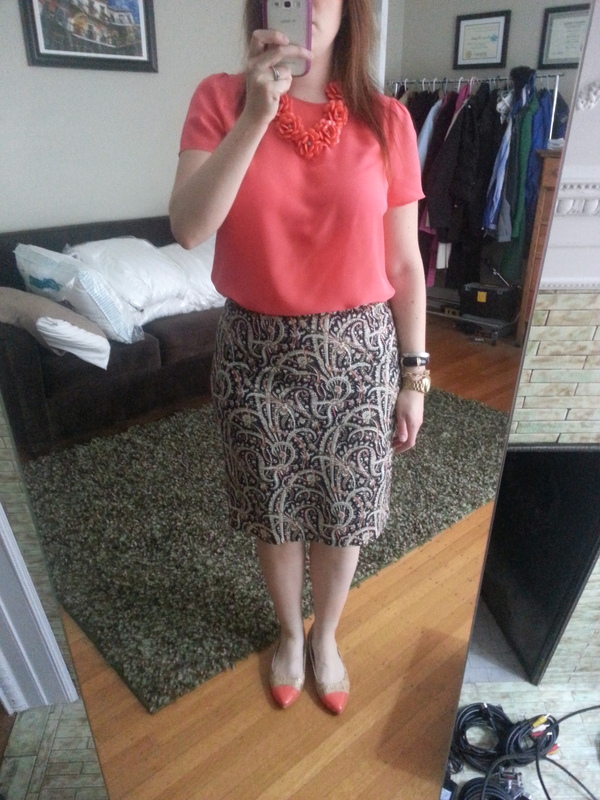 I paired my J.Crew feather paisley skirt from several seasons ago with my new J.Crew silk short-sleeve blouse in dried papaya and J.Crew inspired beaded rose necklace from Groopdealz. I’m loving the silk blouse – which I completely didn’t realize is just a short-sleeve version of the J.Crew Talitha blouse (or boat blouse) from last year that I have and love and wear all the time. I would have ordered it earlier (and in more colors!) if I had known that this was the same blouse. But this color isn’t a color I have much of in my wardrobe so I was glad to find a popback on sale in my size. 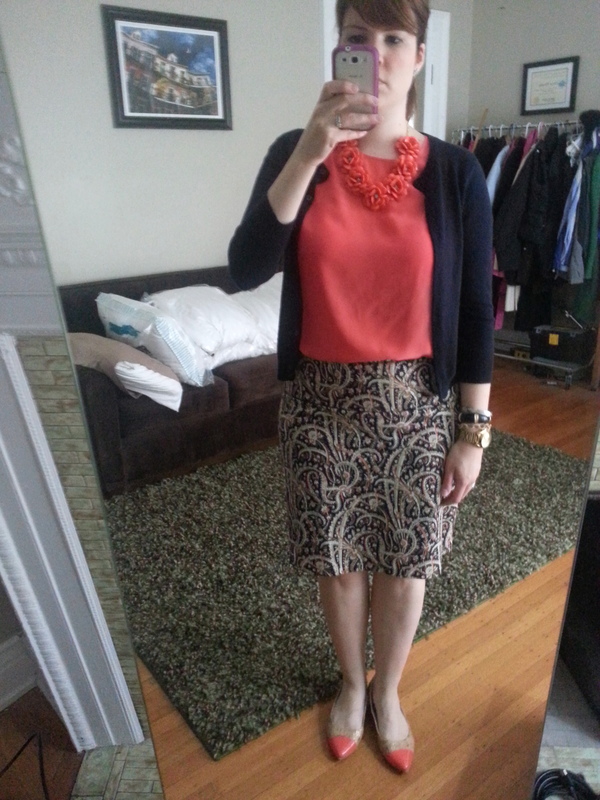 The blouse and skirt alone were a bit more orange than I’m used to and knowing it would be cold at work, I added my J.Crew featherweight cashmere cardigan in navy and I think it pulled together nicely. Don’t mind my poor beat up feet…trying to break in a pair of Born flops for vacation later this summer and that was the result. More bright colors for a rainy day…would love to hear what you think of the outfit and thanks for visiting! 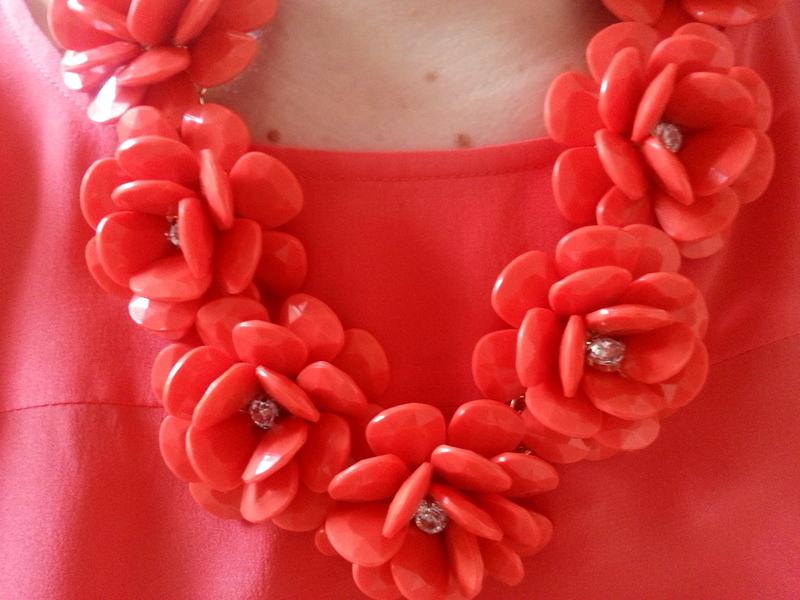 Does your necklace flip out during the day while you’re wearing it? Mine does that & I’m constantly re-adjusting. Otherwise, I love it.